My brother found this for me at a garage sale for $30.00. And it works! 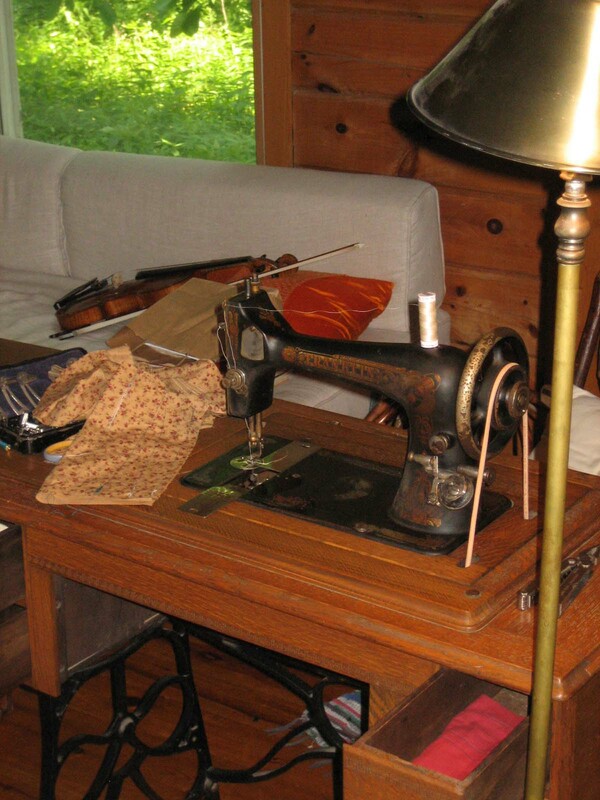 (Just about perfectly…) It is an old Franklin treadle sewing machine, made by Sears and a knock-off of an old Singer. 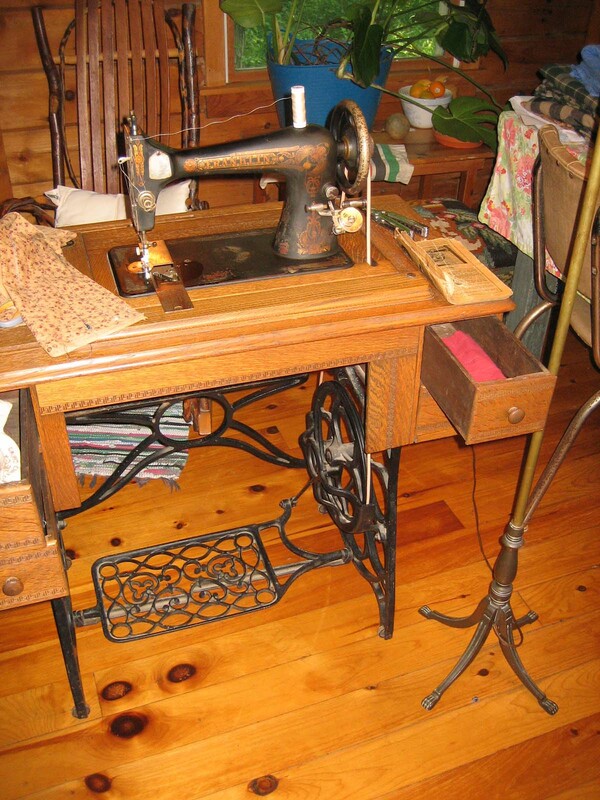 No electricity is needed to power it, just the up and down of feet pressing on the treadle, which is attached to the machine by a leather cord. I love being able to create power for a machine! My friend Pat and I took it apart, and cleaned, oiled and put back together all the parts. It came with the worlds cutest oil tin (which I have since filled with machine oil), and a box of supplies (things to make ruffles, bias tape, and other things that Pat knows how to use!) The machine was missing a bobbin shuttle (I have since found a broken one, and still need a new one..) and had a broken belt. Other than that it is fully operational! We went to the sewing store in Ottumwa and bought a new belt, and need to find a new bobbin shuttle (pictured above, looks like a bit like a bullet) somewhere. 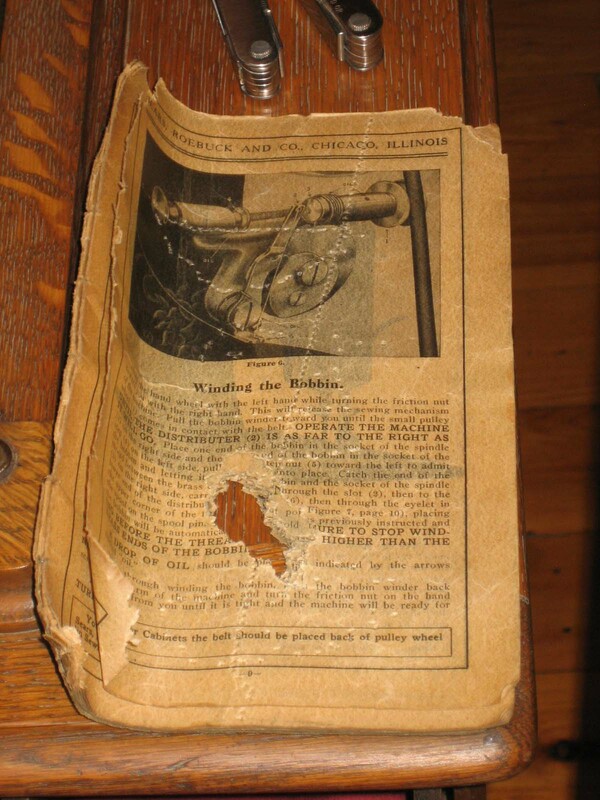 The manual is in a mostly usable condition…which is amazing considering it is about 100 years old. Too bad a mouse got to it…some of the directions are chewed off, but you can mostly figure out what is going on by looking at the pictures and text together. The bobbin threader might be my favorite part. 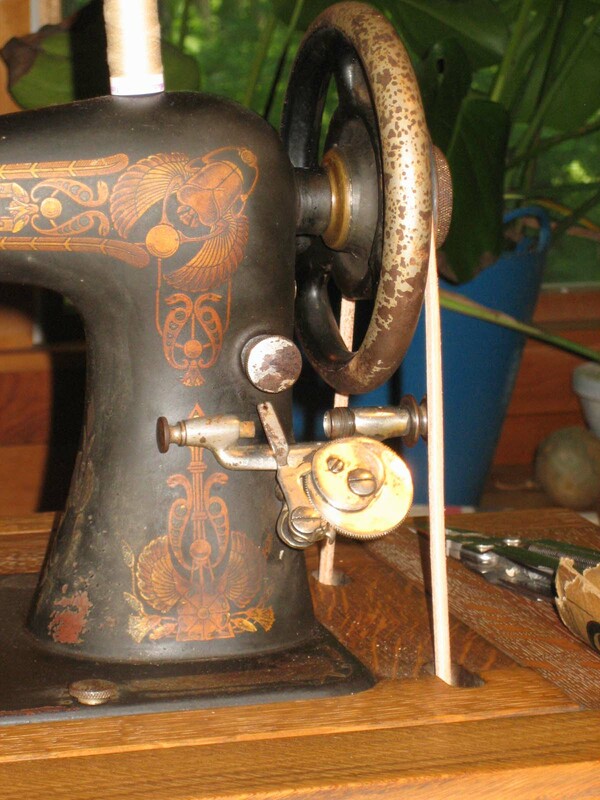 It pops out and connects with the belt, and carefully rotates back and forth to evenly fill the bobbin. The oak box is in really good condition. 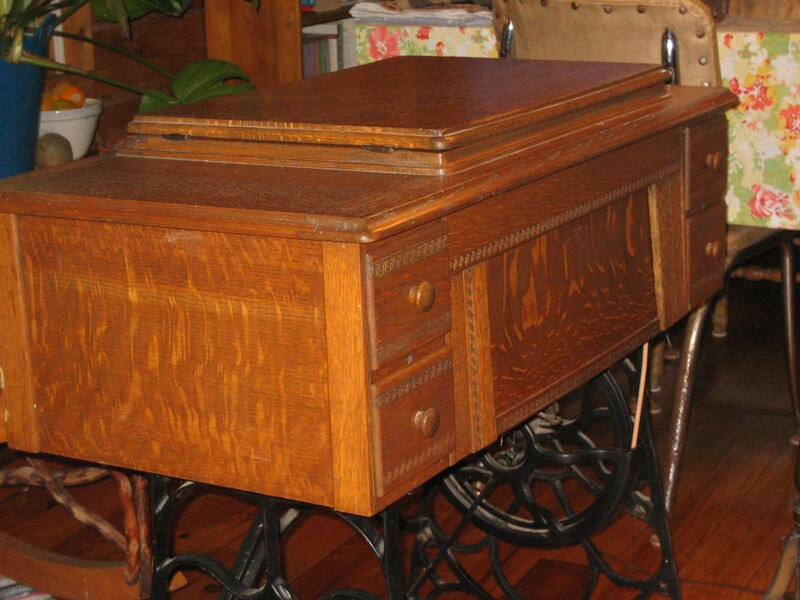 It has four drawers to keep supplies, and the top folds down to put the machine away. My dad is going to find me a lace doily for the top. So pretty! And cool that it even still has the (slightly chewed) manual! 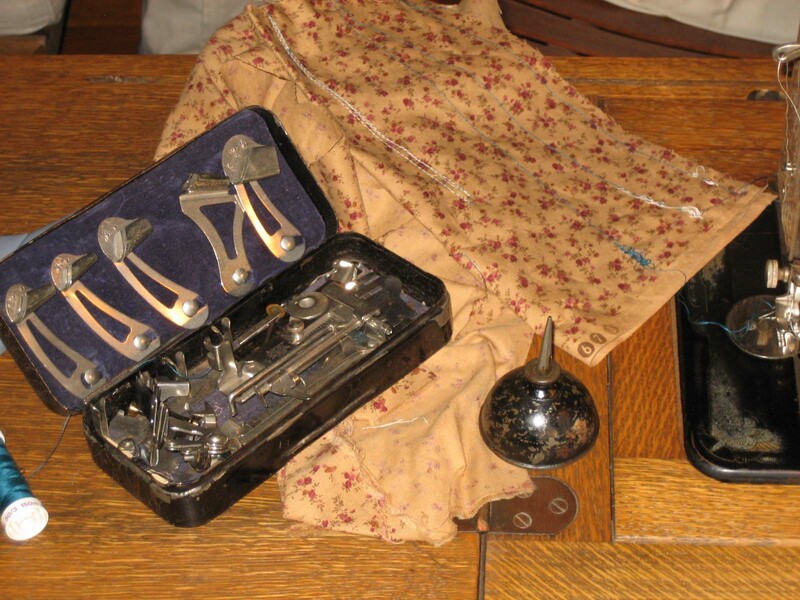 Treadle sewing machines would be great for no power days…and fun on other days. 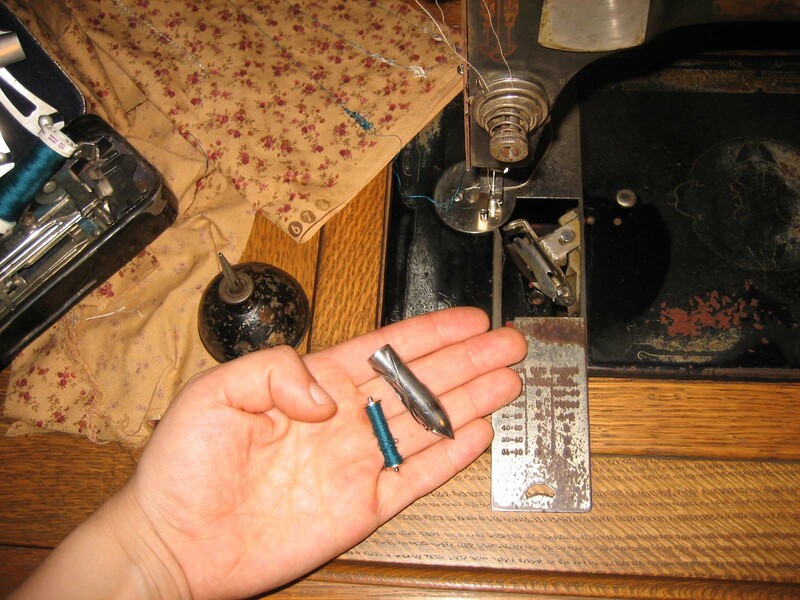 Not tried one…my sister has my grandmothers Singer treadle. Once you find a bobbin case it will be interesting to see how challenging is it to keep a steady stitch?